This is our first insect update for this year. It is about that time when we need to be reminded about ambrosia beetles. Why should you be concerned about these beetles? 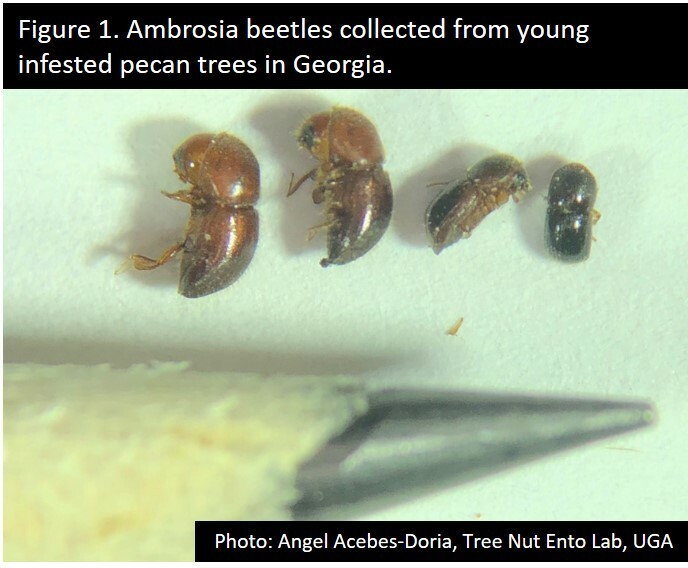 These tree boring beetles (Figure 1) attack many trees in the southeast including pecans. 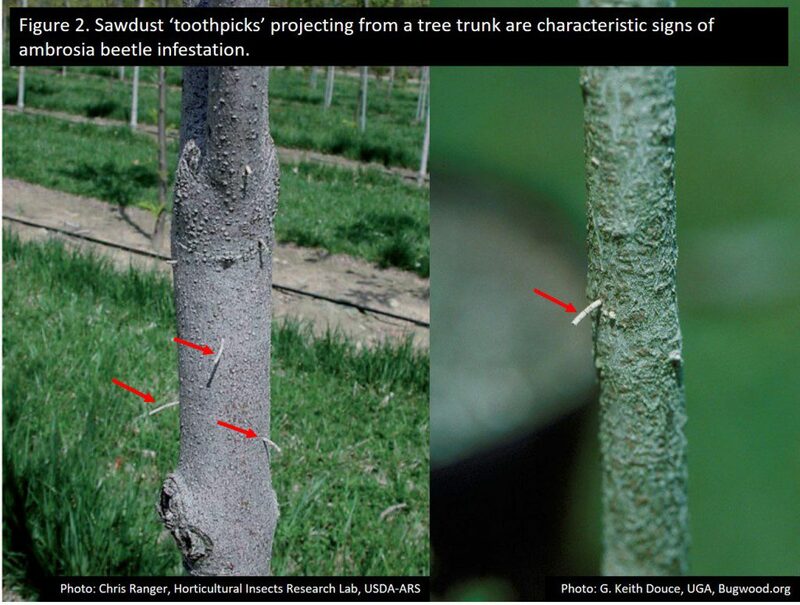 Although trees can recover from attacks by these beetles, the higher the attack – the more likely the trees could die. Who should be concerned? Those of you who have young trees. Previous reports indicate that trees less than 3 years are more vulnerable. Pay particular attention to trees that are recently planted and those that are in poorly drained/flooded areas. 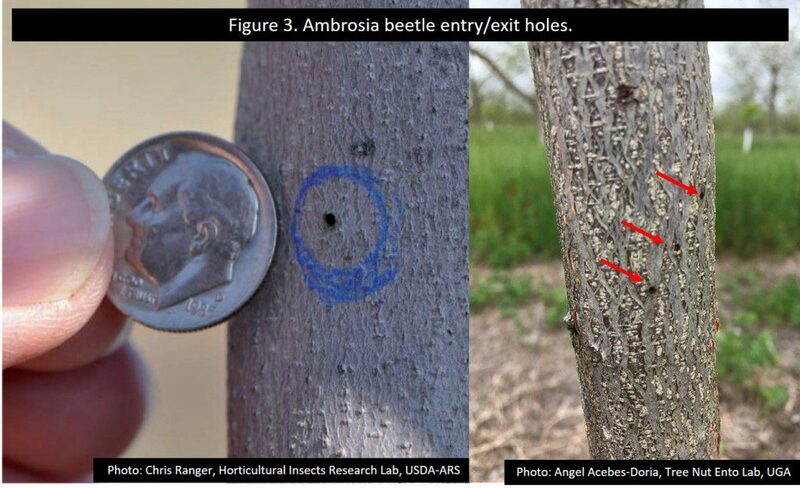 These beetles prefer to attack trees that are already weak and stressed, and they are poor at colonizing healthy trees. How can you tell if your trees are infested? You will see these sawdust ‘toothpicks’ (Figure 2) sticking out of the trunks. Be mindful that these sawdusts can be dislodged by rain or wind, thus checking for small holes (Figure 3) on the trunks is also advisable. Do not confuse these with the bigger yet shallow holes commonly arranged in lines (Figure 4) as these are caused made by sap suckers (birds). 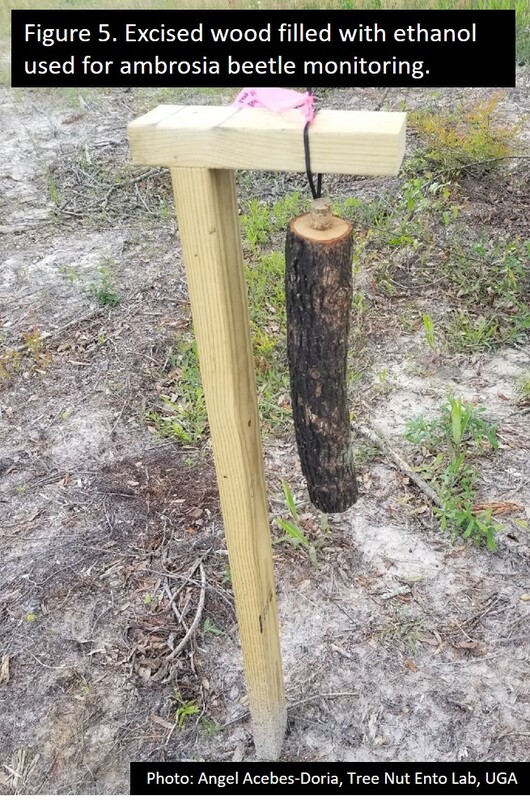 What trap can you use to monitor for ambrosia beetles? Use the wood bolt trap with drilled hole in the middle (Figure 5). See the detailed instructions in making this trap here . Fill the hole with ethanol or ethyl alcohol. Denatured ethanol is acceptable. Alcohol products that contain methanol or isopropyl (most rubbing alcohol) are not as attractive to these beetles compared to ethanol. When and where should you deploy the traps? In south Georgia, it is recommended to deploy traps as early as February 1 of each year. Check the traps regularly for the appearance of sawdust ‘toothpicks’ and holes on the wood. Deploy the traps along woodlines since these beetles will be coming from the wooded areas. Take note that the purpose of these traps is not to control the beetles, but to track when beetles are active. What should you do once beetle activity is observed? Application of pyrethroids (bifenthrin, cypermethrin and permethrin) is the most effective control tactic. Application should be repeated at frequent intervals (7-10 days) until the trees have completely flushed out (and immediately if it rains). 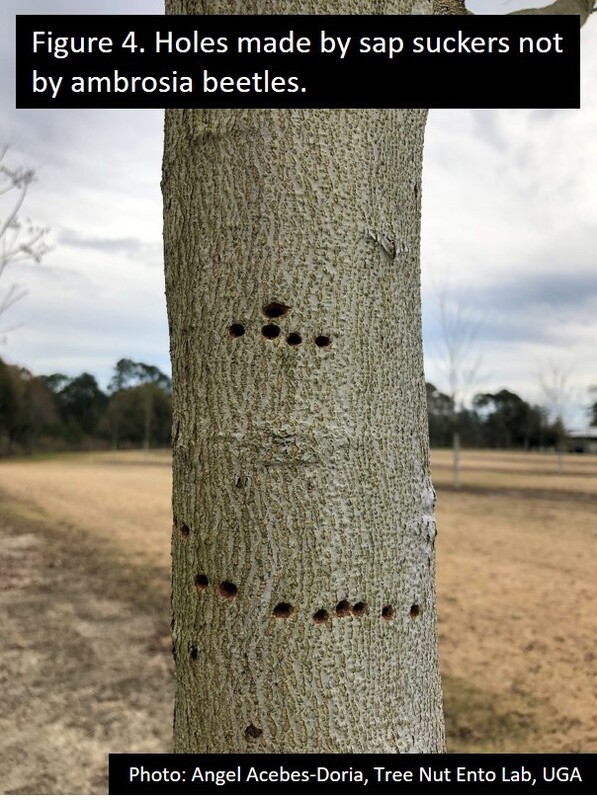 Any trees that show symptoms (toothpicks and holes) should be treated individually with a hand gun as soon as the attack is detected. Quick action is vital to have the best chance of saving the tree. It may be necessary for pecan growers to remove the plastic protective guards from the young trees in order to check for infestations and perform site-specific treatment. Are there ways you can do to prevent ambrosia beetle attacks in the future? We wish we could definitely say yes but preventive actions against these beetles have not been developed yet. However, since we know that these beetles prefer to attack trees that are weak and stressed, maintaining healthy trees would be a way to prevent or at least lessen the risk of future attacks. Some growers have reported that seemingly healthy trees have been attacked before. Keep in mind though that physiologically-weakened trees may not show obvious symptoms of stress. Your best course of action is to be vigilant and continue to monitor for signs of infestations. [ALA1]I’ll include the hyperlink here for your previous post. Posted in Insect Management. Bookmark the permalink.